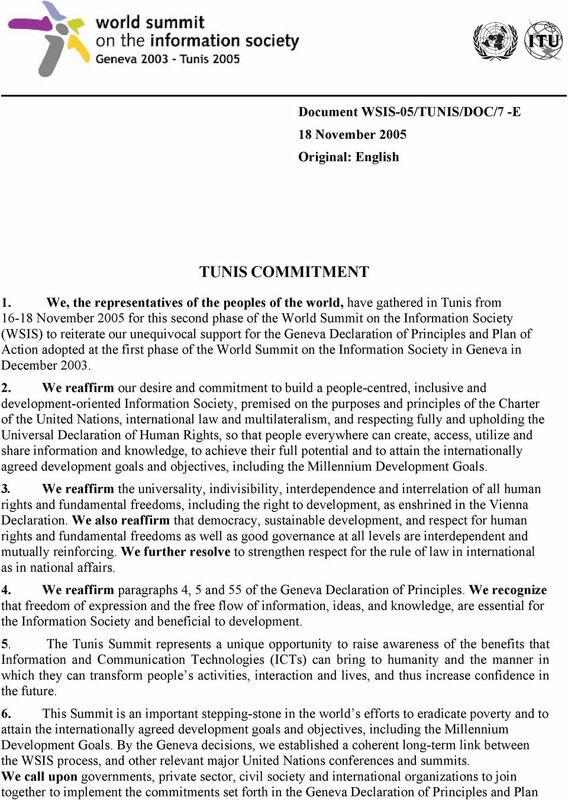 Download "TUNIS COMMITMENT. Document WSIS-05/TUNIS/DOC/7 -E 18 November 2005 Original: English"
2 2 - of Action. In this context, the outcomes of the recently concluded 2005 World Summit on the review of the implementation of the Millennium Declaration are of special relevance. 7. We reaffirm the commitments made in Geneva and build on them in Tunis by focusing on financial mechanisms for bridging the digital divide, on Internet governance and related issues, as well as on follow-up and implementation of the Geneva and Tunis decisions, as referenced in the Tunis Agenda for the Information Society. 8. 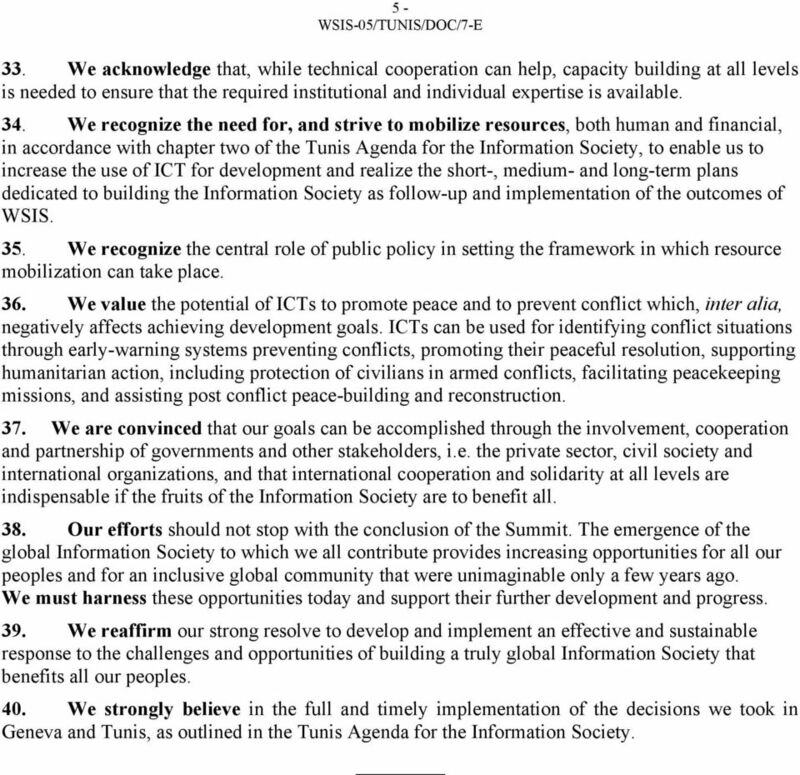 While reaffirming the important roles and responsibilities of all stakeholders as outlined in paragraph 3 of the Geneva Plan of Action, we acknowledge the key role and responsibilities of governments in the WSIS process. 9. We reaffirm our resolution in the quest to ensure that everyone can benefit from the opportunities that ICTs can offer, by recalling that governments, as well as private sector, civil society and the United Nations and other international organizations, should work together to: improve access to information and communication infrastructure and technologies as well as to information and knowledge; build capacity; increase confidence and security in the use of ICTs; create an enabling environment at all levels; develop and widen ICT applications; foster and respect cultural diversity; recognize the role of the media; address the ethical dimensions of the Information Society; and encourage international and regional cooperation. 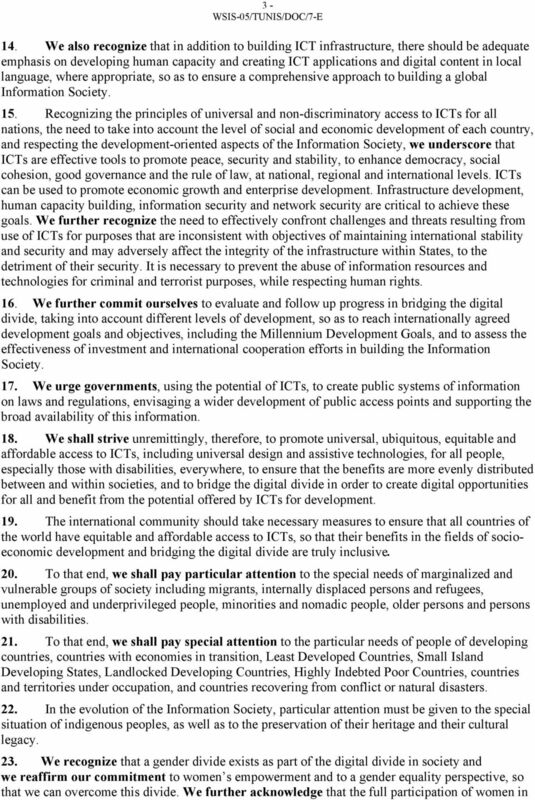 We confirm that these are the key principles for building an inclusive Information Society, the elaboration of which is found in the Geneva Declaration of Principles. 10. We recognize that access to information and sharing and creation of knowledge contributes significantly to strengthening economic, social and cultural development, thus helping all countries to reach the internationally agreed development goals and objectives, including the Millennium Development Goals. This process can be enhanced by removing barriers to universal, ubiquitous, equitable and affordable access to information. We underline the importance of removing barriers to bridging the digital divide, particularly those that hinder the full achievement of the economic, social and cultural development of countries and the welfare of their people, in particular, in developing countries. 11. Furthermore, ICTs are making it possible for a vastly larger population than at any time in the past to join in sharing and expanding the base of human knowledge, and contributing to its further growth in all spheres of human endeavour as well as its application to education, health and science. ICTs have enormous potential to expand access to quality education, to boost literacy and universal primary education, and to facilitate the learning process itself, thus laying the groundwork for the establishment of a fully inclusive and development-oriented Information Society and knowledge economy which respects cultural and linguistic diversity. 12. We emphasize that the adoption of ICTs by enterprises plays a fundamental role in economic growth. The growth and productivity enhancing effects of well-implemented investments in ICTs can lead to increased trade and to more and better employment. For this reason, both enterprise development and labour market policies play a fundamental role in the adoption of ICTs. We invite governments and the private sector to enhance the capacity of Small, Medium and Micro Enterprises (SMMEs), since they furnish the greatest number of jobs in most economies. We shall work together, with all stakeholders, to put in place the necessary policy, legal and regulatory frameworks that foster entrepreneurship, particularly for SMMEs. 13. We also recognize that the ICT revolution can have a tremendous positive impact as an instrument of sustainable development. In addition, an appropriate enabling environment at national and international levels could prevent increasing social and economic divisions, and the widening of the gap between rich and poor countries, regions, and individuals including between men and women. 4 4 - the Information Society is necessary to ensure the inclusiveness and respect for human rights within the Information Society. We encourage all stakeholders to support women s participation in decision-making processes and to contribute to shaping all spheres of the Information Society at international, regional and national levels. 24. We recognize the role of ICTs in the protection of children and in enhancing the development of children. We will strengthen action to protect children from abuse and defend their rights in the context of ICTs. In that context, we emphasize that the best interests of the child are a primary consideration. 25. We reaffirm our commitment to empowering young people as key contributors to building an inclusive Information Society. We will actively engage youth in innovative ICT-based development programmes and widen opportunities for youth to be involved in e-strategy processes. 26. We recognize the importance of creative content and applications to overcome the digital divide and to contribute to the achievement of the internationally agreed development goals and objectives, including the Millennium Development Goals. 27. We recognize that equitable and sustainable access to information requires the implementation of strategies for the long-term preservation of the digital information that is being created. 28. We reaffirm our desire to build ICT networks and develop applications, in partnership with the private sector, based on open or interoperable standards that are affordable and accessible to all, available anywhere and anytime, to anyone and on any device, leading to a ubiquitous network. 29. Our conviction is that governments, the private sector, civil society, the scientific and academic community, and users can utilize various technologies and licensing models, including those developed under proprietary schemes and those developed under open-source and free modalities, in accordance with their interests and with the need to have reliable services and implement effective programmes for their people. Taking into account the importance of proprietary software in the markets of the countries, we reiterate the need to encourage and foster collaborative development, interoperative platforms and free and open-source software, in ways that reflect the possibilities of different software models, notably for education, science and digital inclusion programmes. 30. Recognizing that disaster mitigation can significantly support efforts to bring about sustainable development and help in poverty reduction, we reaffirm our commitment to leveraging ICT capabilities and potential through fostering and strengthening cooperation at the national, regional, and international levels. 31. We commit ourselves to work together towards the implementation of the Digital Solidarity Agenda, as agreed in paragraph 27 of the Geneva Plan of Action. The full and quick implementation of that agenda, observing good governance at all levels, requires in particular a timely, effective, comprehensive and durable solution to the debt problems of developing countries where appropriate, a universal, rule-based, open, non-discriminatory and equitable multilateral trading system, that can also stimulate development worldwide, benefiting countries at all stages of development, as well as, to seek and effectively implement concrete international approaches and mechanisms to increase international cooperation and assistance to bridge the digital divide. 32. We further commit ourselves to promote the inclusion of all peoples in the Information Society through the development and use of local and/or indigenous languages in ICTs. We will continue our efforts to protect and promote cultural diversity, as well as cultural identities, within the Information Society. 5 5-33. We acknowledge that, while technical cooperation can help, capacity building at all levels is needed to ensure that the required institutional and individual expertise is available. 34. We recognize the need for, and strive to mobilize resources, both human and financial, in accordance with chapter two of the Tunis Agenda for the Information Society, to enable us to increase the use of ICT for development and realize the short-, medium- and long-term plans dedicated to building the Information Society as follow-up and implementation of the outcomes of WSIS. 35. We recognize the central role of public policy in setting the framework in which resource mobilization can take place. 36. We value the potential of ICTs to promote peace and to prevent conflict which, inter alia, negatively affects achieving development goals. ICTs can be used for identifying conflict situations through early-warning systems preventing conflicts, promoting their peaceful resolution, supporting humanitarian action, including protection of civilians in armed conflicts, facilitating peacekeeping missions, and assisting post conflict peace-building and reconstruction. 37. We are convinced that our goals can be accomplished through the involvement, cooperation and partnership of governments and other stakeholders, i.e. the private sector, civil society and international organizations, and that international cooperation and solidarity at all levels are indispensable if the fruits of the Information Society are to benefit all. 38. Our efforts should not stop with the conclusion of the Summit. The emergence of the global Information Society to which we all contribute provides increasing opportunities for all our peoples and for an inclusive global community that were unimaginable only a few years ago. We must harness these opportunities today and support their further development and progress. 39. We reaffirm our strong resolve to develop and implement an effective and sustainable response to the challenges and opportunities of building a truly global Information Society that benefits all our peoples. 40. We strongly believe in the full and timely implementation of the decisions we took in Geneva and Tunis, as outlined in the Tunis Agenda for the Information Society.